The GISP has become a respected and in-demand indication of your skills as a GIS professional. If you are pursuing the GISP credential, or are thinking of doing so, join us on April 3 and 4, 2018 for a six-hour, two day virtual event, as a group of talented GIS experts share valuable information that can increase your chance of success. Day one (Tuesday, April 3) will explore the reasons that the GISP credential is worth pursuing as well as what is involved in completing each part of the application. 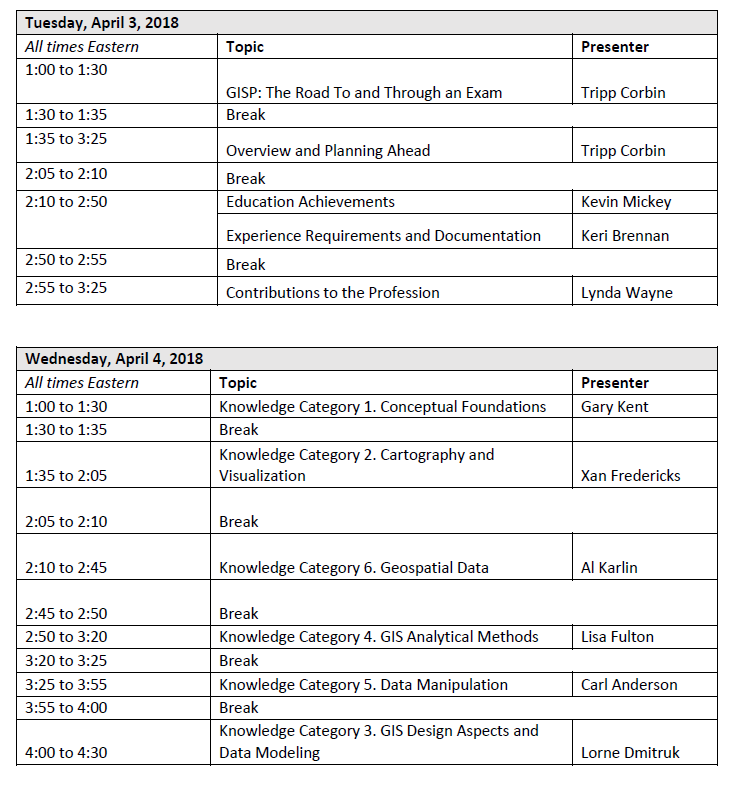 Day two (Wednesday, April 4) will explore the topics that you need to be familiar with for each of the knowledge areas covered by the GISP exam. Information presented in this webinar is designed to help professionals who have extensive GIS education and experience, but need to know what topics to review prior to taking the exam. It also will help individuals with some GIS experience that may be lacking in one or more areas covered by the exam and that need to know where to find additional resources to study. To view the following URISA Connect archived webinars you must have the Adobe Connect plug-in installed. If you are unsure of click here to test Adobe Connect. Please note that even free webinars need to be checked out through the URISA Online Store. Today, most government organizations have some type of GIS programs in place. They vary from being in their early stages, to the rebuilding or tuning-up phase, to being completed changed as new technologies and applications emerge. This virtual workshop is designed to provide guidelines for managing your GIS program. It will look at the various organizational and technical issues program managers must address in order to develop a successful GIS program. Packed with examples and practical knowledge, this session will show the importance of having access to good addresses and the risks involved when addresses are incorrect or out-of-date. Is your organization prepared to make this type of investment? What can happen if you don’t? In this follow-up webinar to our first event, Addresses: Return on GIS Investment, Key to Local Government, our presenter will discuss the various ways to collect, maintain and share good address data across the enterprise. How do municipalities know where their GIS development is in relationship to potential capability for similar agencies? Some agencies consider their GIS to be ‘mature’ because their implementation project has been completed and they are doing ongoing GIS operations and maintenance. But how do these agencies know if they are lacking basic GIS capability? Capability maturity models have been used to assess the ability of agencies to develop software successfully. This presentation outlines URISA’s proposed Municipal GIS Capability Maturity Model, discusses results and feedback from applying the model to city and county GIS operations in the Pacific Northwest and nationwide, and suggests future development and application. This presentation will be of value to managers to self-assess their GIS operation, determine areas for efficiency or effectiveness improvements, assess system risk factors, analyze capability gaps, and prioritize developments required for a mature GIS. This educational webinar will present an overview and basic information about state legislative and congressional redistricting, with an emphasis on how GIS data and software are used. It will not be a software training session. The session will cover concepts that reflect the purpose of the redistricting process, including the principle of one person - one vote, the Voting Rights Act, and the several objectives of ensuing fair representation such as compactness, competition, communities of interest, and representational fairness. GIS provides new capabilities to show changes over time. The ability to "animate" the changes in geographic locations over short or long time durations can help the viewer better understand the situation or event. The animation can also be used to capture the attention of viewers of all ages much better then static map portrayals. Examples from the Battle of Brandywine from the American Revolution will be used to illustrate these techniques. In 2010, the Federal Emergency Management Agency (FEMA) launched the Risk Mapping, Assessment and Planning (Risk MAP) program with a vision to: “to deliver quality data that increases public awareness and leads to mitigation actions that reduce risk to life and property”. Risk Map is a nationwide program requiring the collection, organization and dissemination of spatial data from the federal government to state and local governments, planning agencies and private sector contractors. To meet these requirements and further the “one government” approach, FEMA has supported the use of GIS. From desktop, to tablets, to mobile devices, HTML is no longer just the language of websites, it is rapidly taking over as the premier way that software is built. Couple the rise of HTML 5 with the native application market for an increasing number of handheld “post PC era” devices and it becomes clear that the ability to deliver content and application functionality to multiple device form factors will be a technology discriminator for organizations moving forward for the foreseeable future. The GIS/mapping industry is not immune from these larger industry trends and responsive web design will play a critical role in the future of geospatial applications. In today's work environment, it doesn't pay to sit still. Keeping your skills sharp and current can make the difference between moving ahead and becoming stale or even obsolete. Learn from the best minds in the profession and take your skills to the next level by attending the URISA Leadership Academy June 11-15 in Savannah, Georgia. The entire five day program, the only leadership training program of its type, is tailored to industry leaders and practitioners faced with unique challenges of GIS leadership and management and who want to make an impact leveraging the power of GIS. If you’re interested in learning more about the ULA, URISA is offering a one hour informational session, presented by ULA Committee Chair and Instructor, Hilary Perkins, GISP. She’ll provide an overview of the topics discussed during the week and you’ll have the opportunity to hear about this exciting learning experience from recent ULA graduates. LiDAR is an emerging optical remote sensing technology that uses pulses of light to determine an object’s range and other pertinent information. Most commonly, LiDAR is used to generate terrain products including surface models and elevation contours. LiDAR data is also being used to generate accurate 3D visualizations, which can be used for a variety of planning, engineering and construction activities. ***All purchases are final. No refunds available. Please note that if the file to view the archived presentation is no longer active, URISA will make the presentation available in a different format.